As I live in Gothenburg, a town situated on the western coast of Sweden, I can often count on it being windy and rainy at this time of year. And even if you dress for that particular type of weather, you often feel chilled to the bone. Last Tuesday, on my way to work, I felt a little sorry for myself, it being pitch black outside and, yeah, you guessed it, cold with a strong wind blowing. But I soon forgot all about the weather, thanks to Elvis. My way to work always takes me past a store that sells used record. This particular morning I glanced at the shop-windows, as I always do, and stopped dead in my tracks. Would you believe one of the windows was decorated solely with Elvis records! It was a sight to behold, and I couldn't help thinking that a lot of other people would see this too. And best of all, in the lower right hand corner of the window I spotted what looked like a mint copy of the single "I'm Leavin'." "I gotta lay my hands on that one, so Michael Jarrett, the writer of the song, can autograph it when he plays in Sweden in May," was my immediate thought. My spirits lifted, I continued my journey and soon arrived at work. There, I telephoned my wife who had the day off, and asked her if she could run down and buy the single, as I would be travelling to Stockholm later that day and wouldn't be back until the end of the week. "Yeah, I guess I could buy it on Thursday," she said. "Maybe today," I asked her pleadingly, painting a picture in my head of another person getting it before she did. And, being the nice person she is, she bought it for me later that day. When I came home I found the single waiting for me, in pristine condition. And the day after, taking a walk with my wife, I asked her if we could go to the store so I could take a picture of the window for my blog. It sure helps to have an understanding wife when your second love is Elvis! Now and then I like to visit a record store close to where I live. Granted, I buy most of my records on the Internet nowadays, but it's a good feeling looking through the racks. Remember when this was the only way to obtain an album? 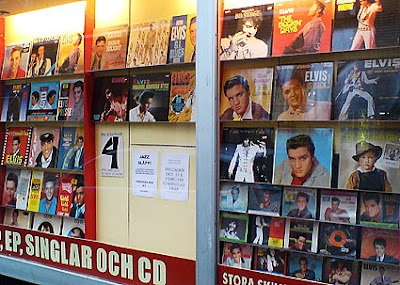 Anyhow, this time around I noticed some newly produced LP's for sale, among them Elvis At Sun. I already have that one on CD but I bought it nevertheless. I guess I just welcomed the chance to buy a new Elvis' record on vinyl. After all, that's a thing that doesn't happen very often. At home I placed it on the turntable and laid down on the couch in the living room. And there was Elvis singing "Harbour Lights" followed by "I Love You Because." Not bad, but not very exciting, either. But then came the familiar slap of Bill Black's bass, accompanied by Scotty Moore on lead guitar and Elvis providing rhythm guitar and the vocals I know so well: "Well, that's all right, mama. That's all right for you." And in that moment I caught a glimpse of what Sam Phillips must have thought when he heard it for the first time, the "something different" he'd been looking for. It must have been months since I listened to "That's All Right" from July 5, 1954, but in that moment I felt it, too. After the uneventful "I Love You Because" it sounded so fresh and exciting, with Elvis singing full of confidence. I spent a pleasant 48 minutes on the couch, listening at Elvis at Sun and rediscovering not only "That's All Right" but also the rest of Elvis' sun catalogue. I wonder what Elvis song or album I will get reacquainted with next? Side One: "Also Sprach Zarathustra (2001 Theme)"/"See See Rider"/"Proud Mary"/"Never Been To Spain"/"You Gave Me A Mountain"/"A Big Hunk O' Love"/"For The Good Times"
Side Two: "Burning Love"/"An American Trilogy"/"It's Over"/"I Can't Stop Loving You"/"Polk Salad Annie"/"Funny How Time Slips Away"/"Lawdy Miss Clawdy"/"Can't Help Falling In Love"
"Running a record shop at the time and importing Elvis discs from the USA I got a flyer from my supplier that the next Elvis release would be "Standing Room Only" complete with the track details (as per post above). Then I got a flyer stating the LP would be postponed because RCA would rush-release the Madison Square Gardens album to beat the bootleggers." "It makes sense that they dropped the original, all-live, idea when New York came up, and I guess they might have then planned a fall release for the live/studio version of SRO... but the upcoming "Aloha" show made that impossible. And we got "Burning Love And Hits From His Movies, Volume 2" instead!" I think he's on to something, and that a reasonable explanation is that the concept of the album went through some changes before the idea was finally cancelled. Proof of this could be Joe Tunzi's reprinted RCA document showing that the album was rescheduled to a October 1972 release but then permanently withdrawn on August 17, 1972. Now all I can do is to wait for the linar notes accompanying FTD's version of Standing Room Only, where I hope Ernst Jorgensen sets the record straight. By the way, seems like the bootleggers have already released their version of the album, and chosen the live only approach. Having just read that the next FTD-release Blue Hawaii (available February 15) will be followed up with a 2 CD version of Standing Room Only one month later, I remembered the first article I wrote for the Swedish fan club Tidskriften Elvis back in 1988. Titled Standing Room Only - The Soundtrack That Never Was, it told the story of RCA's planned but ultimately scrapped 1972 album consisting of live and studio recordings from February and March that year. As you may probably know, the plans were so well advanced that the album was advertised on the cover of the "An American Trilogy" single for summer release. "Maybe there's still a chance that the LP will be released? Not very likely, most of you probably think, but as RCA has a tendency to release albums in conjunction with different anniversaries, how about Standing Room Only "twenty years after", in 1992. Something to look forward to, don't you think?" This made me smile, as it's now 2009, 17 years after 1992. Actually, when FTD's version of Standing Room Only sees the light of day in a couple of months, it will be 37 years since it was originally planned for release. Talk about a delay! 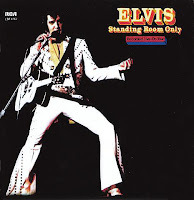 PS: According to Tunzi's book Elvis Session both the front and back of the cover for Standing Room Only are the same as for Elvis As Recorded At Madison Square Garden, only the title and track list differ. Makes sense, since attention was shifted to the latter as the former was dropped. What is more of a mystery, is that the songs listed are all "Recorded Live - On Tour." I usually check out the the schedule for TCM (Turner Classic Movies) every morning in the TV section of my morning paper. The reason for this is that this channel more often than not is screening an Elvis film. The last couple of days has been no exception, on the contrary. So far this year TCM has offered us Double Trouble, Kissin' Cousins, The Trouble With Girls, Viva Las Vegas and Speedway, if I remember correctly. With Elvis' birthday around the corner, I though this was a build up of things to come. But, to my disappointment TCM isn't broadcasting anything with Elvis today on January 8. Talk about an anticlimax! Visiting the TCM site on the Internet I found out that the American edition does deliver. So, for you living in the States with access to this channel, you can watch King Creole at breakfast and then stay home and have your own Elvis movie marathon with G.I. Blues, Blue Hawaii, Girls! Girls! Girls!, Fun In Acapulco, Roustabout and Elvis On Tour. For us living in Europe, we'll have to think of something else, like watching Elvis on DVD. That ain't a bad alternative, even if it isn't the same. When an Elvis movie is showing on TV, you know you share the experience with others who are watching the same thing. And that's especially true on a day like the one today. Happy birthday, Elvis! Yesterday I had some e-mail contact with Arjan Deelen who's putting together "The Original Elvis Tribute 2009" that I wrote about a week ago. Arjan left a comment on my blog that he wanted me to contact him. The reason for this was that songwriter Michael Jarrett, who is part of the show, would like to thank me for the things I wrote about him and his two songs "I'll Be Home On Christmas Day" and "I'm Leavin'." That's the power of both the Internet and Elvis! Here I am, sitting in front of my computer in Sweden, writing about things that has do with The King, and a couple of days later I'm talking to both the producer of an Elvis Show and to an Elvis songwriter, via e-mail. Naturally I was thrilled to hear from Michael Jarrett, after all he's the one who wrote two of my favourite Elvis songs. I'm really looking forward to meeting him in May this year when "The Original Elvis Tribute 2009" will be playing in Sweden. As a matter of fact, it was a very happy Arjan Deelen who wrote me yesterday and told me that the first show in Sweden was now a fact, and that the concert will take place at the Katalin in Uppsala on Wednesday, May 20th. I looked it up on the Internet and it seems like a great showroom, where a lot of well known Swedish artists are performing. Arjan also told me the band is going to "knock my socks off" and that the man behind the microphone, Ted Roddy, is a singer whose approach to the material reminds him of how Elvis handled songs like "Guitar Man" and "Big Boss Man." No jumpsuits, no wigs - just great singing and showmanship." Also, the set list will include a lot of surprises, with songs like "Tomorrow Is A Long Time" and "I Will Be Home Again." Sure sounds like you wanna be in the audience! I for one have marked May 20th in my calendar with big letters. The Nashville Marathon trilogy released by FTD in their classic album series. I was especially impressed with That's The Way It Is, and positively surprised by Love Letters From Elvis. Maybe Elvis Country didn't offer much in the way of unreleased material, but it made the Marathon complete. Another nice FTD addition was Elvis Sings Memphis, Tennessee. Also known as The Lost Album, it was intended to be the follow up to Put Luck, and brings together all the songs from the two Nashville sessions in May 1963 and January 1964. On the bootleg front I have to mention Back With A Bang! This one contains the Las Vegas Midnight Show from March 22, 1975, and is highly enjoyable. Elvis is in high spirit and delivers song after song from his 70's catalogue, such as "Promised Land," "Green Green Grass Of Home," "Fairytale," "My Boy" and "It's Midnight." A great Elvis moment last year was seeing Glen D. Hardin perform in March at my local theater. He was on stage together with a tribute act called The Cadillac Band, featuring Elvis impersonator Justin Shandor behind the microphone. The re-issued book Elvis From Memphis to Hollywood, by former Memphis Mafia member Alan Fortas, I remember as a good read. What I liked most about it was that you got an understanding of how it was to be around Elvis Presley and work for him. So there you have it, some of the things and experiences that made 2008 a good Elvis year for me. Here's to hoping 2009 will be even better. High on my wish list are three albums I would like to see released by FTD: How Great Thou Art, Good Times and Promised Land. The one thing I thought 2008 didn't offer were some exciting DVD releases. So, while I'm at it, how about an Elvis On Tour - Special Edition? Or maybe that's a wish you could call the impossible dream?